In wrapping up my first year of post-doctoral training at UNC-CEED, I’ve reflected over the experiences of the past year. While the fall was full of traditional academic experiences, like training to become a therapist for our couples treatment of eating disorders studies, UCAN and UNITE, and starting an independent research plan, the spring and summer were brought novel opportunities to become involved with fundraising for UNC CEED with the UNC-Chapel Hill campus and greater triangle communities. It’s time to thank these individuals for their amazing contributions! This past March, I had the pleasure of serving as a judge for the UNC Panhellenic Council’s 5th annual Greek Groove at UNC’s Memorial Hall. In short, Greek Groove is a dance competition between among the sororities at UNC, with all proceeds benefitting UNC CEED. When I was initially asked to serve in this role, I thought to myself, “Sure, why not? !” As a dancer throughout my formative years and a UNC Panhellenic alum, this opportunity sounded right up my alley! Needless to say, I had no idea that I would be blown away by the enthusiasm, talent, and evidence of sheer dedication to this event. To say the least, this year’s organizer, Sara Ingraham, was on top of every detail, resulting in a smoothly executed, heart-warming, and most successful evening. Memorial Hall, which holds 1,434 people, was standing room only, and the cheering never stopped! The event started with an incredibly touching video, “Why We Greek Groove,” which involved brief clips of UNC sorority women detailing the importance of uniting to promote body acceptance and eating disorder awareness on campus and beyond. After a few warm-up acts, the UNC sorority women began their dance-off. Although Alpha Delta Pi stole the #1 spot this year, voting proved very difficult! I could not have been more impressed with the dance choreography and theme development – from tributes to the music of Beyoncé to a routine reflecting the daily life of an iPhone (very clever! ), these girls had it covered! 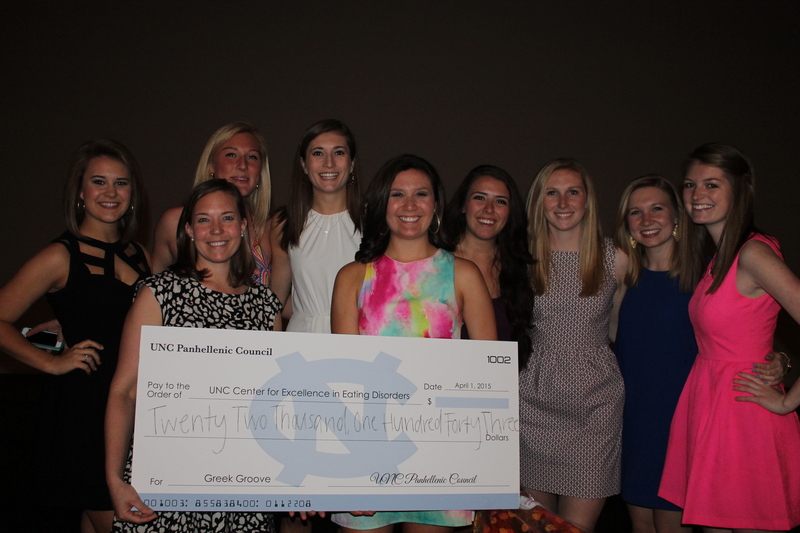 Sara and the Panhellenic Council, together with the sororities at UNC, raised a whopping $22,143 to benefit UNC-CEED. WOW! Sara and Panhel, I could not have been more amazed at your work and dedication. THANK YOU! More recently, I, along with several other members of the CEED team, got to experience “the cleanest dirty fun you’ll ever have,” with the Bottom Line Burlesque and Comedy Troupe’s first annual show to benefit UNC-CEED (see Cindy’s recent post for a thorough overview of the event). When Cindy approached me earlier in the spring about doing a little routine as part of the show, I had another one of those, “Sure, why not? !” moments. This would give me a chance to put all of those years of dance lessons to good use! About a week before the performance, I met with Ruby, the Troupe’s founder, and her team. What a lovely group of people! Ruby gave me a quick hug and put me straight to work, practicing the “Put on a Bustier” piece. The next thing I knew, I was donned with lace and boas and twirling around! The night of the show, I “volunteered” from the audience for my part, and surprised the audience members afterwards with the fact that I was an undercover member of the CEED team! What a fun way to spread the word about CEED’s mission and research opportunities. We were most impressed with the Bottom Line Troupe and their expression of body acceptance and love. Ruby and team, thank you for inviting me to be a part of your Troupe for a night! Transitioning out of graduate training and into a postdoc role has offered amazing opportunities for community involvement this year. It’s incredibly encouraging to see members of UNC’s campus and the community at large recognize the need for eating disorders awareness and treatment. The benefits from Greek Groove and the Bottom Line’s performance are already serving to support training of eating disorders clinicians and additional outreach efforts. THANK YOU!